February is usually a tough month for me. For being the shortest month of the year, it seems overly long, rather dull, and much too grey. In fact, the dreariness is so heavy that the occasional peek of sunshine is cause for heartfelt celebration. This year, I’ve been weathering the month of gloomy purgatory pretty well. How, you ask? I’ve found a few small joys that shine a mellow light into the February darkness. These gems are too wonderful to keep to myself, especially when I know there are others out there struggling with the February blahs or needing an infusion of beauty or inspiration. Perhaps one of these little pleasures will be “a light to you in dark places” as well. 1. Steve McCurry’s blog. He doesn’t post often but when he does – WOW! His latest post, Silent Language of Hands (click here), moved me to tears. It is beautiful and powerful and profound. Take a look. Please. 2. Broiled grapefruit for breakfast. Sounds elegant, doesn’t it? This is my favorite way to eat grapefruit and it is so easy to make. Slice grapefruit in half and cut around each triangular section, leaving the fruit in the rind. Sprinkle with a generous amount of brown sugar (about a teaspoon per half). Place under the broiler in a tray with sides and broil until the sugar melts and bubbles and the grapefruit browns around the edges. Cooking times will vary depending on distance from the broiler but it should take less than five minutes. Don’t be surprised if excess brown sugar burns on the pan and smokes a little, setting off the fire alarm, and scaring the fur off the family cats. It’s all worth the aggravation in the end. Place grapefruit halves in bowls, grab spoons, and enjoy. The best part of the whole experience is the warm sweetened grapefruit juice – sublime! Even better – preparing and eating them with someone you love. 3. The Hobbit by J. R. R. Tolkien. I’d read The Hobbit a few times when I was younger, but forgotten much of the story since then. Seeing the recently released movie, with its artistic license and additions to the plot, prompted me to think about a reread. When I was at Barnes and Noble a few weeks ago, I found a hard cover, pocket-sized 75th Anniversary edition with a dust cover of Tolkien’s original illustrations. I couldn’t resist. I am thoroughly enjoying this charming tale. It is far more light-hearted than the movie and less dark and serious than the Lord of the Rings trilogy. Tolkien’s style of writing in The Hobbit is a pleasure to read. I look forward to curling up in bed with my little book to check in on Bilbo Baggins and Company before I go to sleep. After the long hours of work and responsibility, it is a delightful way to end the day. 4. Houzz.com. I love home design and decoration. For the last two years, my husband and I have been remodeling and upgrading our home. Houzz.com is my go-to source for inspiration, solutions to problems, and wishful dreaming. I spend entirely too much time on this site reading the latest idea books and bookmarking favorite images for the current (or next) project. For me, this is F-U-N. And everyone needs to have some playtime in their lives, right? 5. Harney and Sons’ Blueberry green tea. Several years ago, a physician recommended that I drink green tea regularly because of a certain family medical history. At first, I really struggled with the taste of it but have since found several teas that I actually enjoy. Blueberry green tea is my newest discovery. It is so good I don’t even have to add sugar. Getting out of bed is almost easy on these cold winter mornings when I know a hot cup of blueberry tea will be helping me start my day. 6. One Kings Lane. One King’s Lane is a website of curated short-term sales that are updated daily. The offerings range from stationary to luggage to furniture to rugs. My favorite sales are the vintage goods – everything from McCoy pottery to high-priced furniture and art. I very rarely buy anything (Mr. Whimsey may disagree with this remark) but I love looking at all the unique pieces, especially the artwork and furniture, and spying on what other people are willing to pay for these treasures. The daily 11am postings of new sales are a highlight of my day because I get to indulge in a half hour of high-class window shopping from the comfort of my cozy home. And finally, I offer something enchanting to end this post. I don’t know what it is about this video that I find so mesmerizing, but I could watch it for hours. I have seen very small murmurations around my home but nothing like this. It must have been awesome (and I don’t mean that in a surfer dude kind of way). The girl’s facial expressions and laughter at the end says it all. 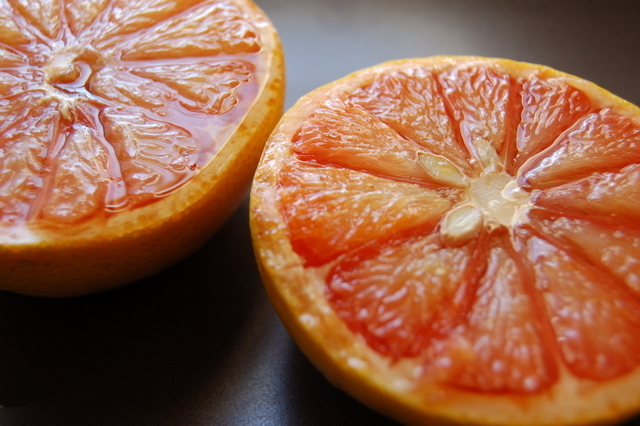 I discovered the joys of broiled grapefruit last year… Delicious! You said it! It’s wonderful.